GOJUS!!! I find myself really hoping Simon comes out with matching dies for this set! I love the little dot stamp, though! I initially colored these with carefully graded step-by-step colors within the same color families and it was BOOOOOORRRRIIINGGGG! So flat! Ugh! So I added some of the orange shades within the purple flower, some of the purple shades within the orange flower, and some of both in the leaves, and it just leapt off the paper and started to breathe! Guys! We don’t have to put ourselves in color coffins when it comes to coloring. With Copics, you can sometimes find that adding a different color will cause some, shall we say, INTERESTING effects, but don’t be afraid to test colors together on a scrap piece of card stock to see if it will work before you put it on your actual image. Over the top of the flowers in the cups of each petal and the tips of leaves I added clear wink of Stella. On the little curlicue pieces I added some clear Spica pen. I stamped the greeting with Versafine Onyx and heat embossed with clear EP. I cut the little fishtails on my card stock by hand. I had a green Wink of Luna that I had gotten in an ArtSnack box, and I added that over some areas of the leaves to make it look even richer. For the background, I layered in the lightest red-violet, RV11, and the very lightest blue-violet, BV0000, next to the image and blended it out with the Copic colorless blending pen. 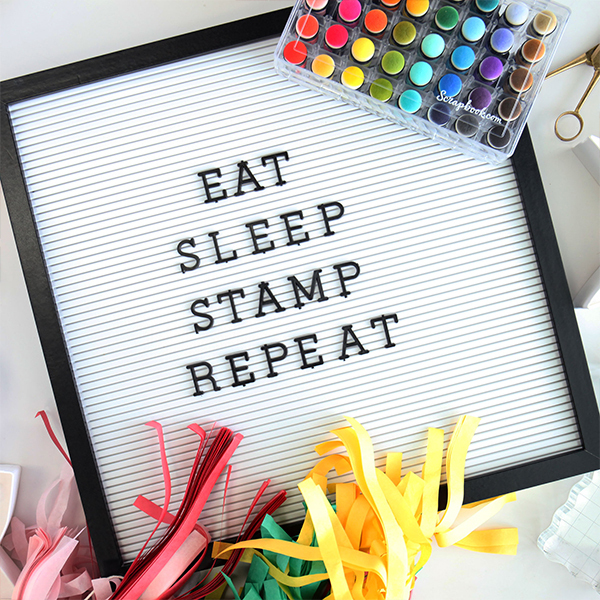 I then stamped with Simon Says Stamp Thistle ink, stamping the full color then stamping the second generation of the color to create lighter and darker dots. I liked the look of this baker’s twine as a great finishing touch, and I could resist adding the little dots of Golden Sunset Nuvo Glitter drops. Again, this turned out gorgeous, and I didn’t even LIKE this color combination. One thing I really love about doing color challenges is that it really pushes me outside my comfort zone and gets me out of ruts. Beautiful card! Such a lovely image! Wonderful coloring too! Wow !! This is a stunning card! !